Under Armour aims to inspire, and it’s what you love doing which keeps them going in turn. With innovation running through its veins, the only way is up for Under Armour and you’re sure to be inspired by an ever-expanding catalogue of sports goods to cater for the fearless and sporting go-getters of our time. Shop the New Arrivals and see how the freshest clothes and accessories could make a difference to your performance. Men and women can find precision in technical fabrics and new age designs to make every activity and adventure 100% rewarding. Comfort is the key to outperforming yourself, and with UA fabric, lightweight, breathable and fast drying options running through all the funky collections - you’ll be running high and dry. Kids can even enjoy more exciting pursuits with hoodies, leggings and plenty of tops to choose from. The right shoes will keep you supercharged too, so whether you’re road running on blitzing round the football pitch, Under Armour footwear, apparel and accessories will have you going that extra mile. How do I use my Under Armour promotion code? Choose an Under Armour discount code to copy and take yourself to underamour.eu via our ‘shop now’ link. Choose your size and colour if applicable before adding the goods you’d like to your bag, then click ‘bag & checkout’ in the pop-up window. Add your promo code into the box and click ‘apply’, your discounts will be redeemed so you can complete your payment securely. Sign up to receive the Under Armour email and you’ll save on shipping costs plus be in with the chance to receive more special discounts. Can I track my Under Armour order? Log in online to see where your Under Armour order is en route. Where is Under Armour in Ireland? Find a store near you using the online tool. Is there an Under Armour size guide? You can use the Under Armour size chart to help you choose the correct size clothing. Delivery takes 3-5 business days and costs €7.95 for orders under €79 but is otherwise FREE. Offering a 100% satisfaction policy, you have 30-days in which to return your Under Armour order should you not be completely happy. Athletes everywhere can feel empowered with Under Armour. 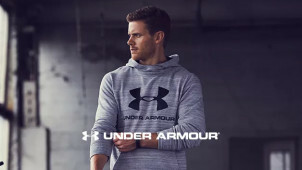 Kitting out men, women and kids too in performance gear that is discerningly stylish, yes, your Under Armour promo code is a veritable secret weapon to nailing your sports gear. From sweat-wicking t-shirts to training shoes, and from smart accessories to breathable legwear, you’ll find apparel for both on and off the sports’ pitch with Under Armour. If you want to be inspired by some superior sporting talent, you can look to the elite team on the Under Armour Roster page. This is your insight into what the pros wear and how it affects their play. Follow in Murray’s footsteps with his centre court polo or get your ballerina gear down like Misty Copeland herself, you can make your mark too when you get on board with these guys. A simple t-shirt can make or break a look, and a workout, but not when you’re wearing one form Under Armour. Stylish to the core and adorned with functional properties, discover UA Tech fast drying fabrics for less with your Under Armour discount code and save on comfortable clothes which will withstand your active lifestyle. Whether you’re going for a run, a yoga class or taking on your daily commute - you can stay cool on all fronts with Under Armour.